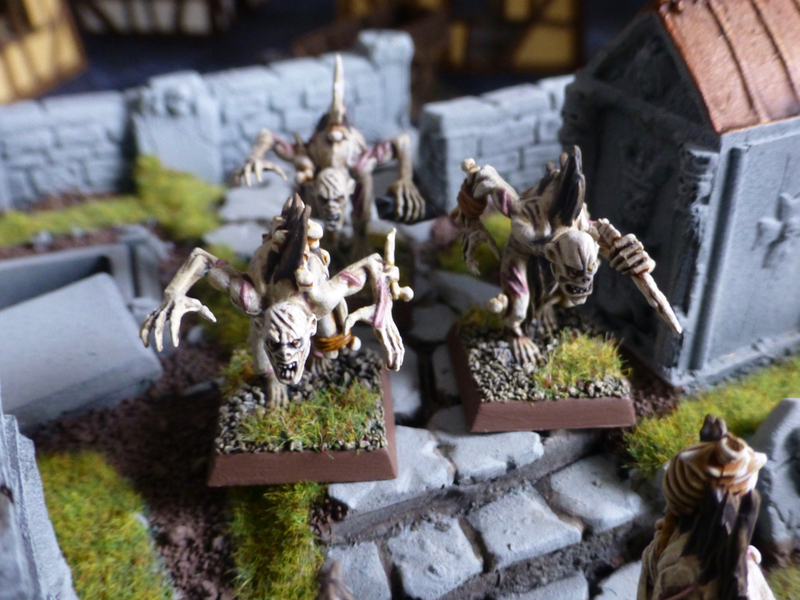 It turned into a bit of a slog towards the end, but I managed to complete my horde of 30 zombies in thrall to the Ghoul Kings for Warhammer Fantasy Battle. A dozen of the figures are metals from The Assault Group that I ordered with their Kickstarter in 2017. Five of the sculpts are now available from their store, while the sixth was an exclusive. 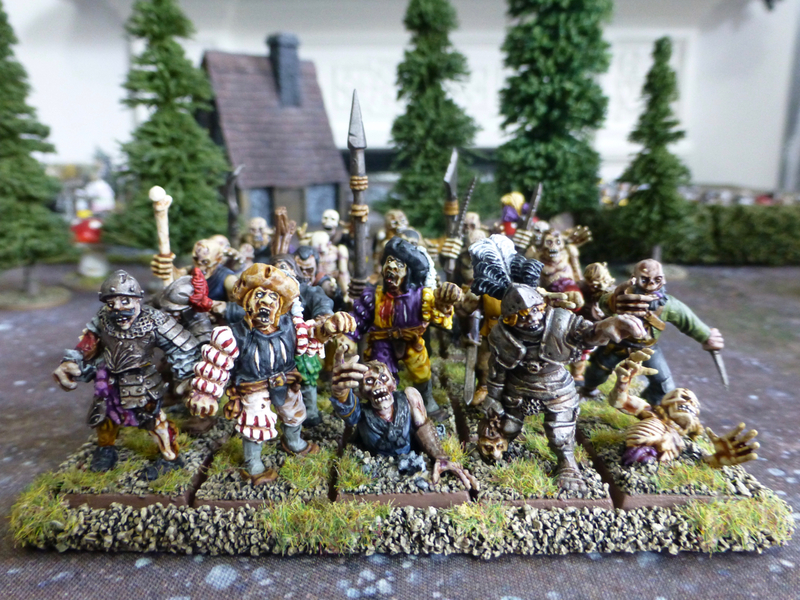 They will tie in nicely with my fledgling Empire army, hence I painted some of the zombies up in the state colours of Ostermark and Ostland. 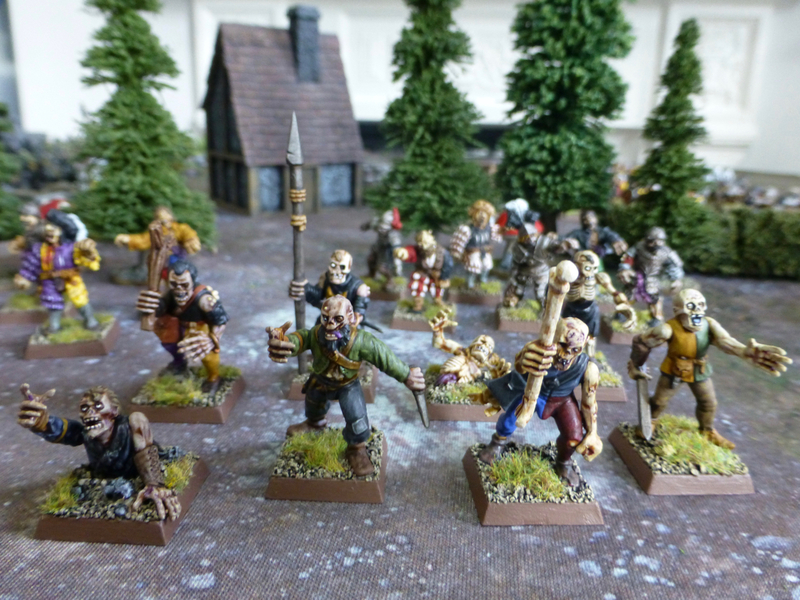 To complete the regiment I dug through my bits box and combined Citadel plastic zombie heads and arms with bodies from the archers and militia sets. One is using the legs and torso of a Perry Miniatures mercenary, while two do not use any legs since I modelled them to be emerging from the cursed soil of Sylvania. 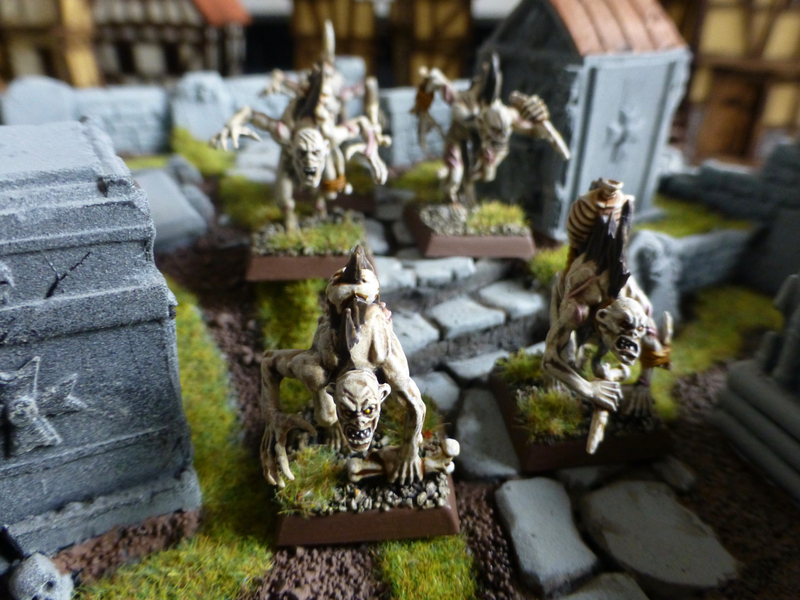 Altogether I have a horde of 60 zombies now for my masters of the necromantic arts to call upon. 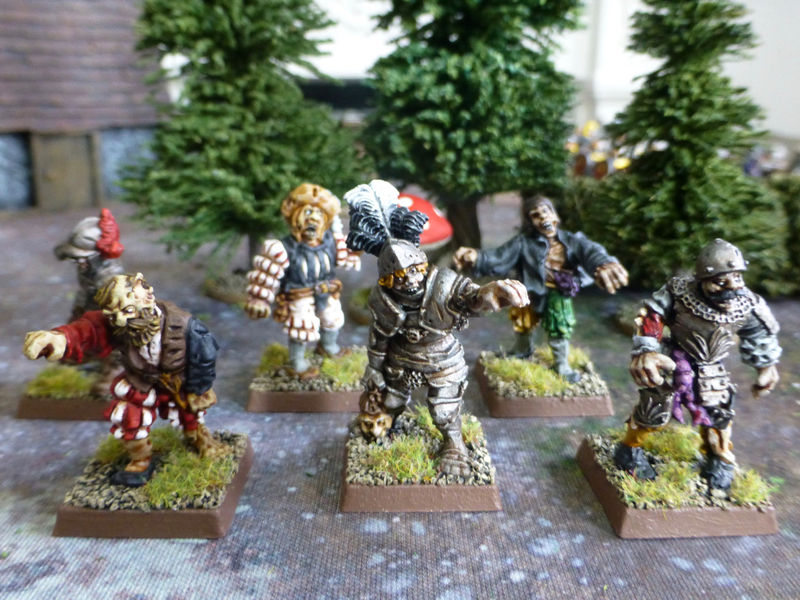 The upcoming Fireforge zombies are looking pretty nice as well, so I might add another unit of them in future. Maybe something for my Salute 2020 shopping list. 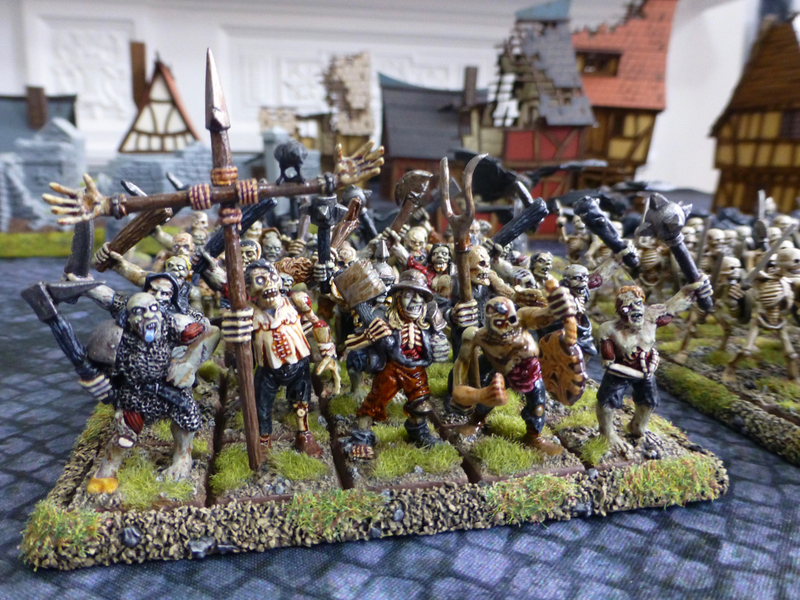 I am sticking with the undead forces for Warhammer Fantasy Battle for the time being. 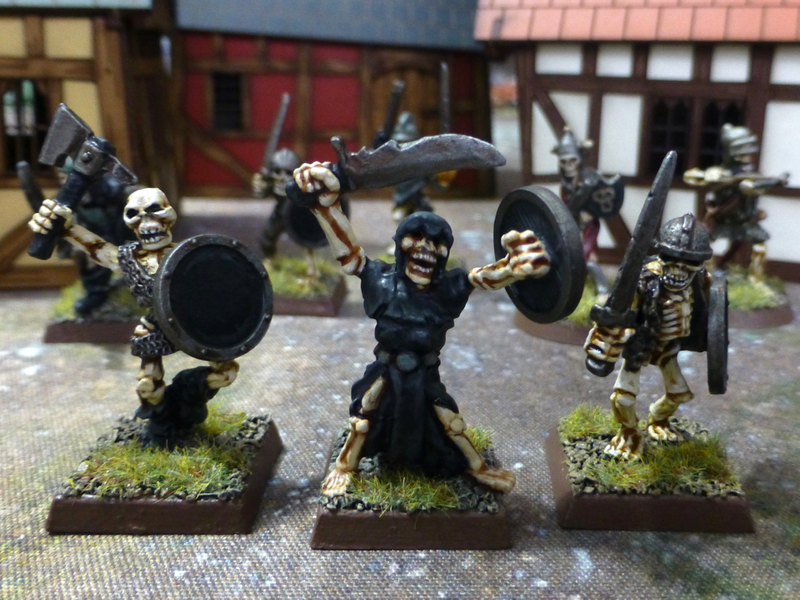 Between painting up a horde of zombies I managed to complete a small hunting pack of ten ghouls that I had purchased a while back when dreaming up my Ghoul King’s force. My existing ghouls consist of the two ranges released in metal in the 90s, while these additions are using the still current plastic set. 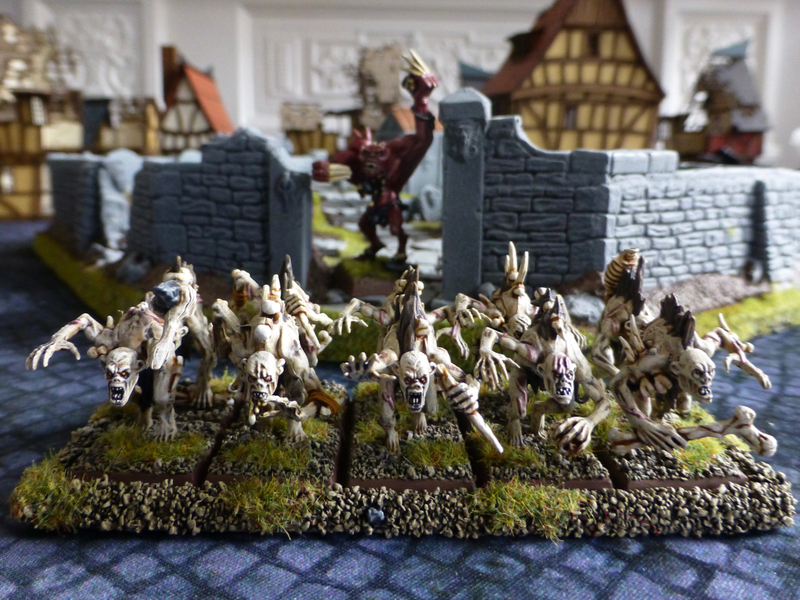 I never liked them very much but wanted to add variety, and there isn’t much choice in ghouls for mass battle units. After building them I started to like them a lot better. 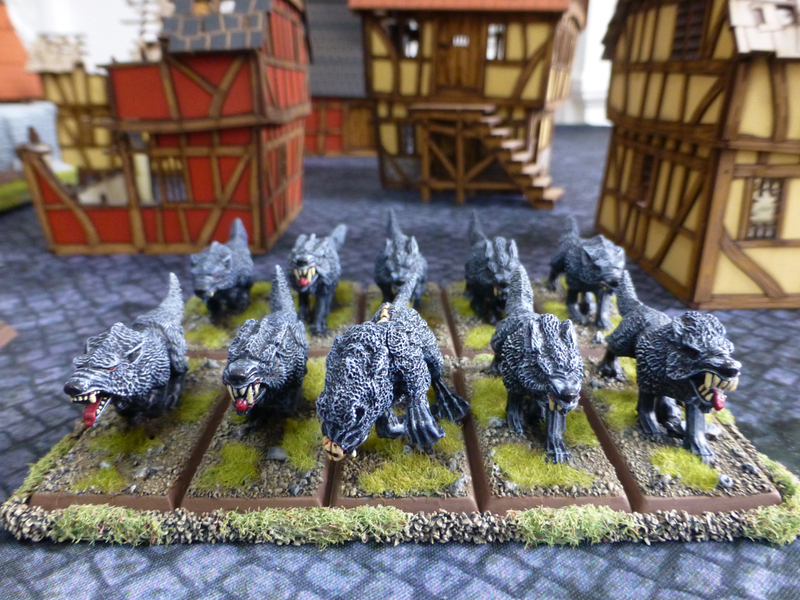 There are a bunch of faces I am not keen on, but by keeping those to a minimum I am quite happy with the pack now. 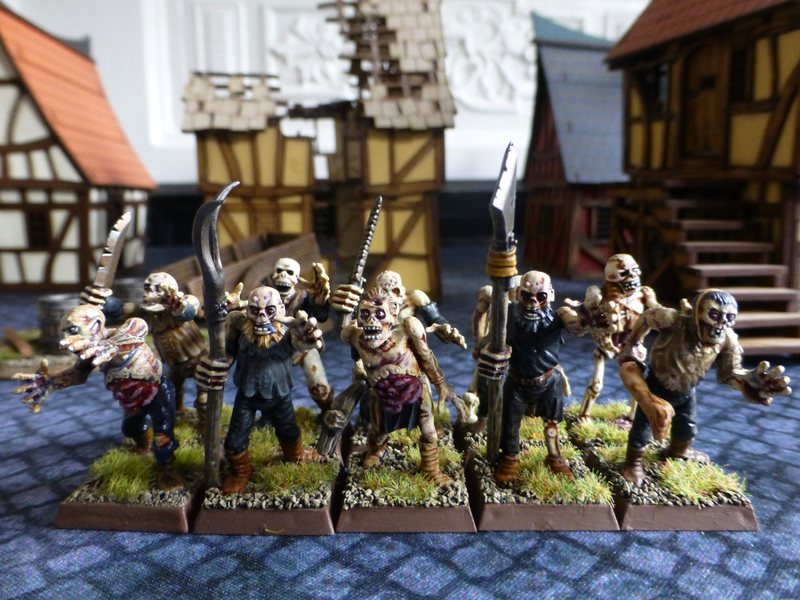 Some of the bodies needed to be glued at an upward angle as they were leaning forward on their bases far too much (a strange practice Citadel employed on a number of regiments at the time, including their skeletons and flagellants), but other than that I did few adjustments. 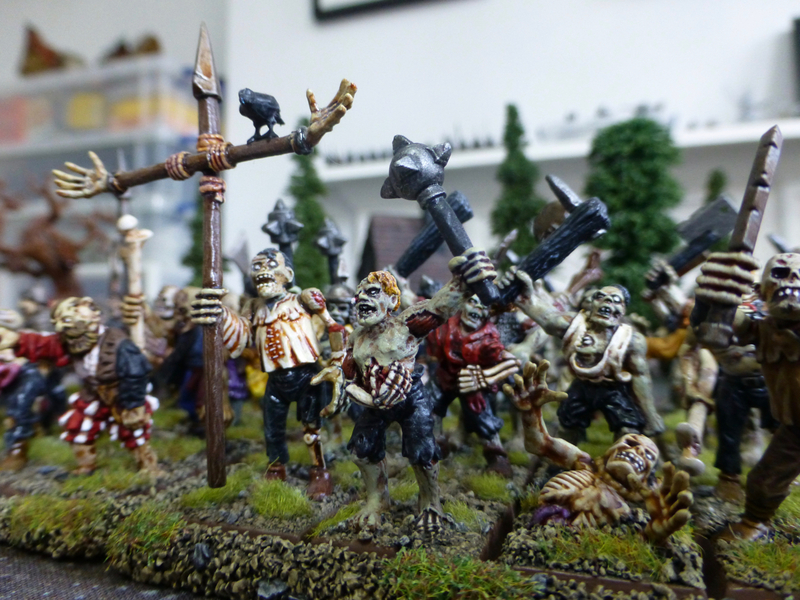 I’ve had some figures built for a second 30 strong unit of zombies for a while, which I am aiming to complete as part of my Ghoul King’s retinue. The first ten are now painted, consisting mainly of figures from the Citadel plastic kit, with a few skeleton parts thrown in to make use of my spares and add variety. I also like the little rat scuttling through the mob. I’m using Warhammer Fantasy Battle 8th Edition as a guide for collecting and painting various forces. 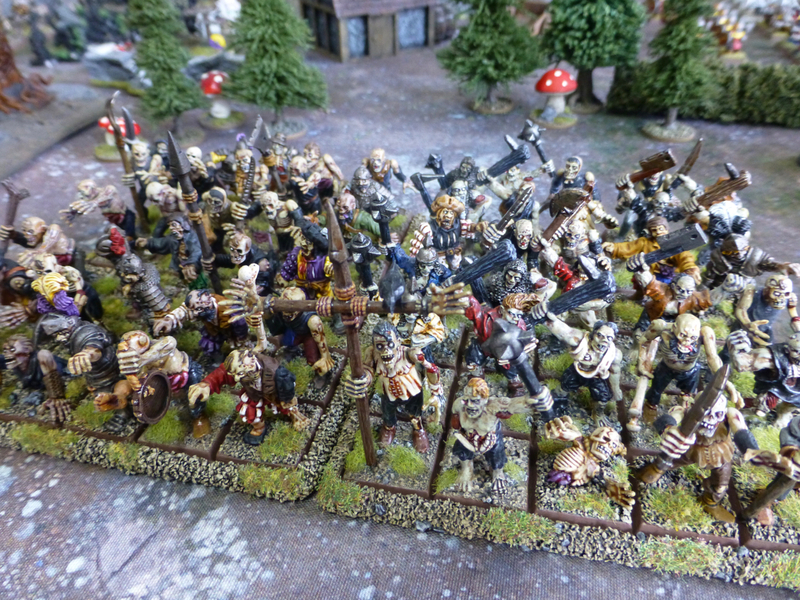 Going for a modest 1,000 points still turns out to be quite a few models as I want to start with the rank and file of each army, leaving the fancier and more costly elements for later expansions. 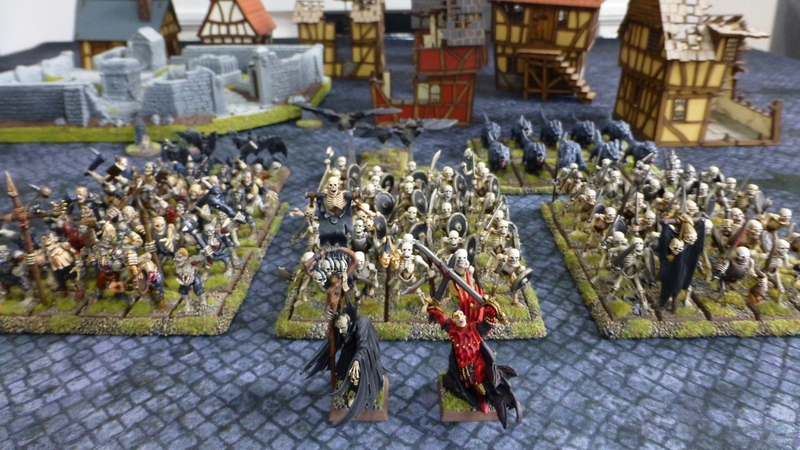 The overall largest faction of painted models in my collection are the Vampire Counts. So rather than forming them into one army I decided to split them into themed sub-factions with the intention of sharing little to no models between them. 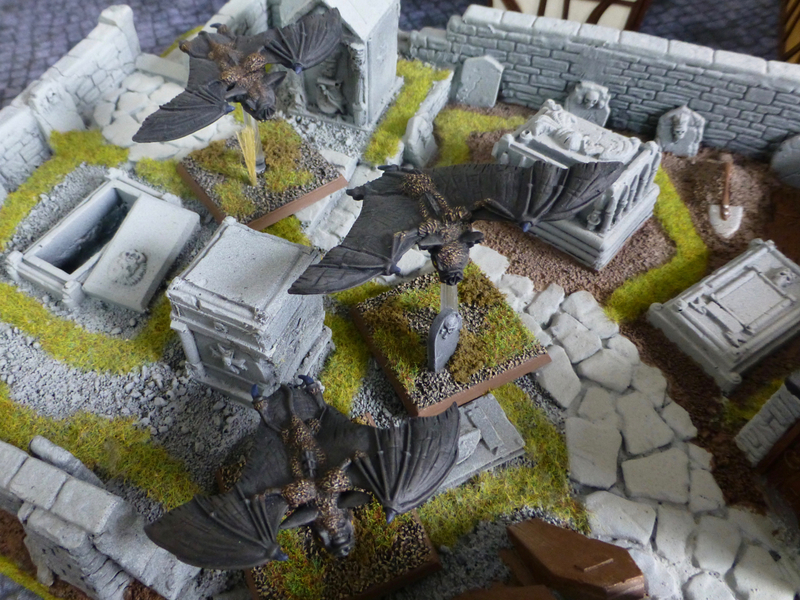 The first faction I am considering finished is a force led by a Vampire Count. 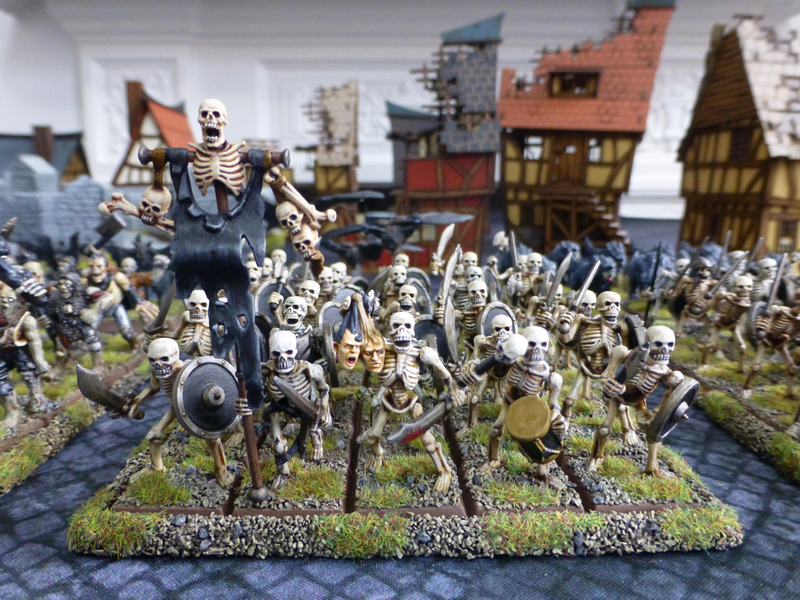 Himself armed with two sharp blades to revel in carnage, the mundane task of raising and maintaining his undead horde falls to a Necromancer in his service. 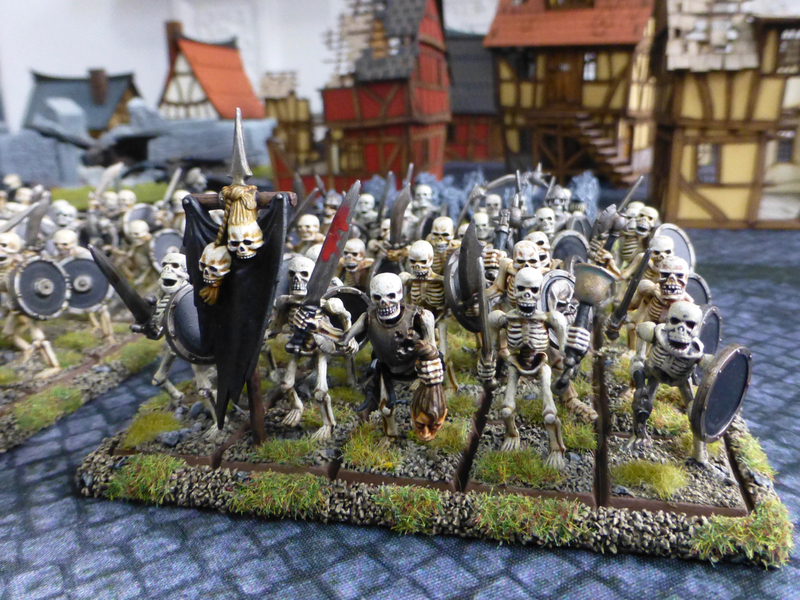 The skeleton regiments are built from three generations of plastic sets with some extra bits taken from Chaos Marauders. 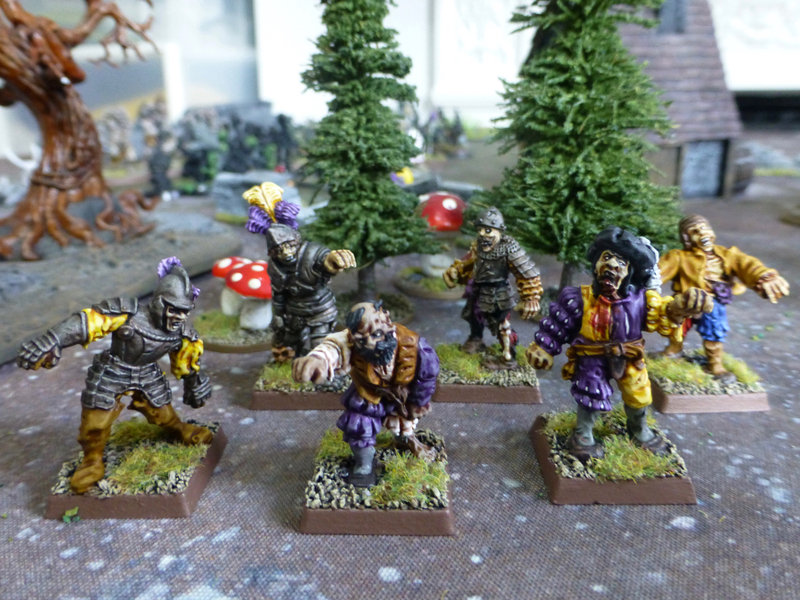 The zombies are a mixture of Citadel metal and plastic figures. 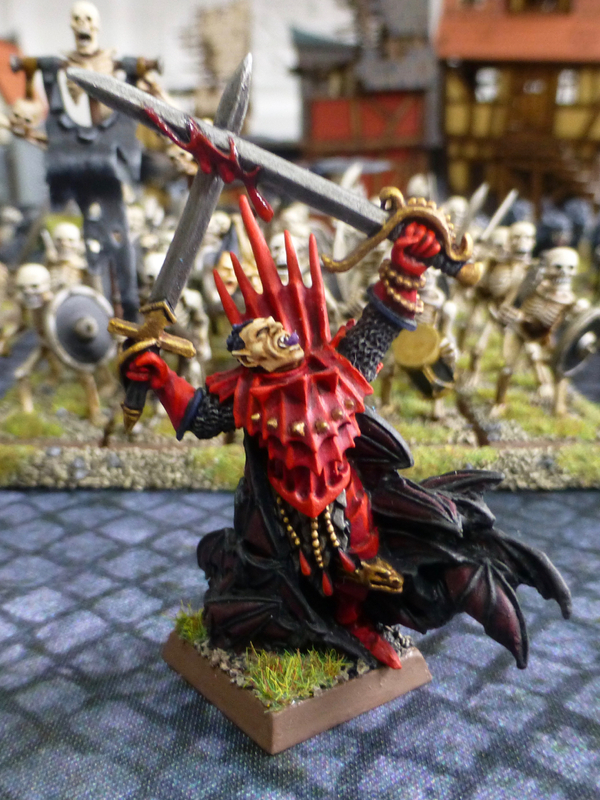 The Vampire Lord is the metal sculpt of Konrad von Carstein, while the Necromancer is the newer plastic kit. 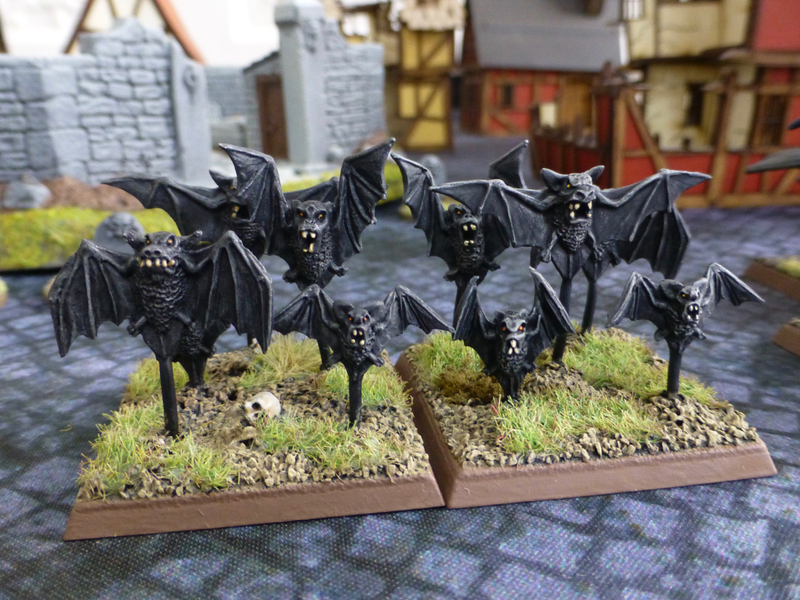 The hunting beasts that have followed the call of their vampiric master are the early plastic wolves with some metal add-ons, a swarm of bats and a flock of giant Fell Bats. 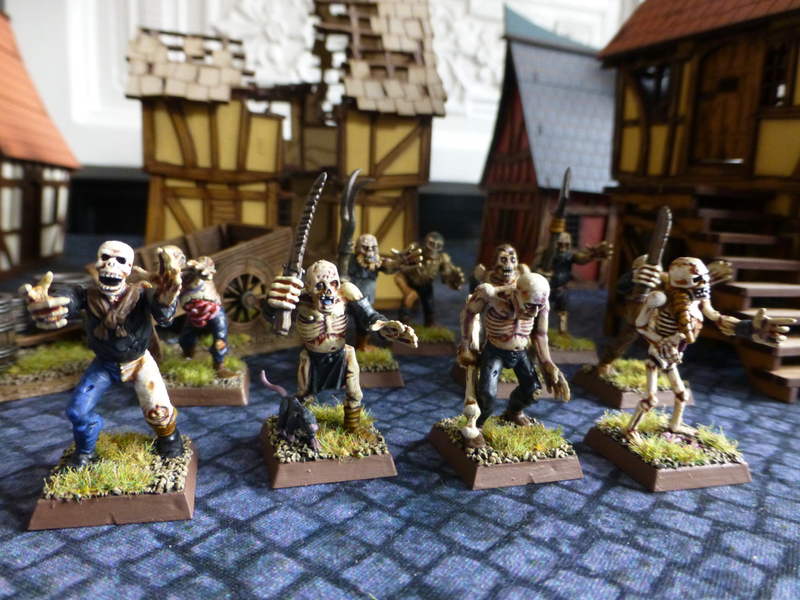 The other two factions I am working on are Ghoul Kings (ghouls, zombies and monsters) and Necromancers (massed ranks of zombies and skeletons). Once they are all assembled, the Old World will tremble before the armies of the dead! 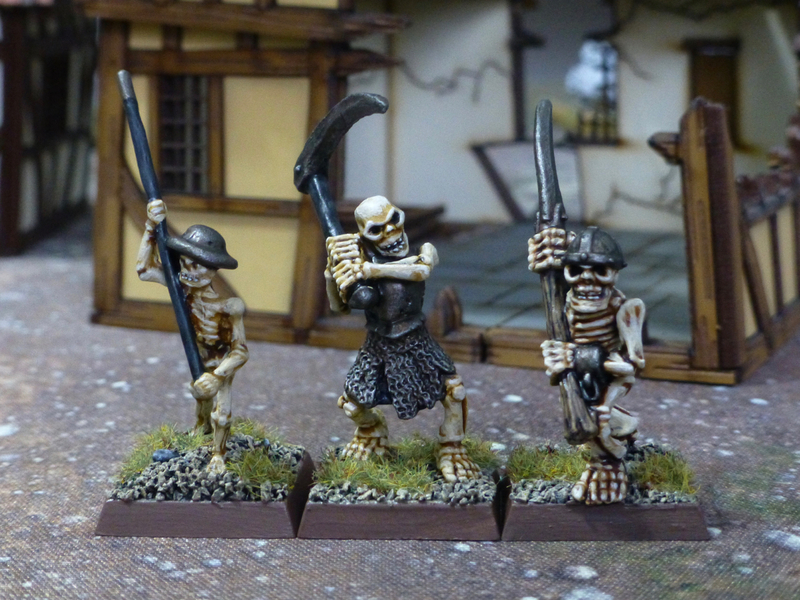 I’m throwing all skeletons with polearms together into a unit of Grim Reapers for my Oldhammer Undead. The majority will probably wield scythes in the end but I am starting with this motley assortment of blades on a stick. 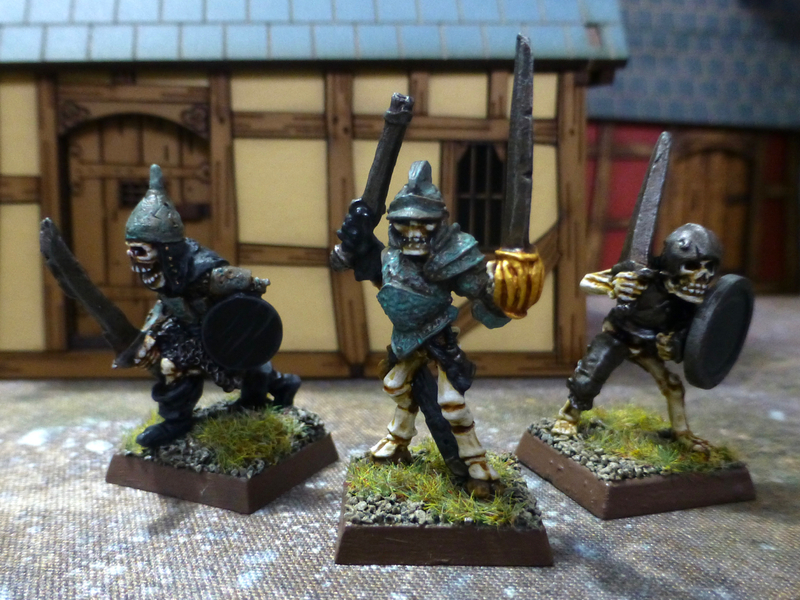 Three of the figures are from Marauder Miniatures, one Citadel, and one is by Bob Olley I believe. The weedy looking fellow on the left in the first photo is possibly Essex Miniatures. The figure was part of a batch purchase and I wanted to do it justice by fielding it all those decades after its creation. I imagine it portrays an unfortunate young farmhand drafted into a long forgotten war. Another broken sculpt from that purchase had already found its place as part of a terrain piece. 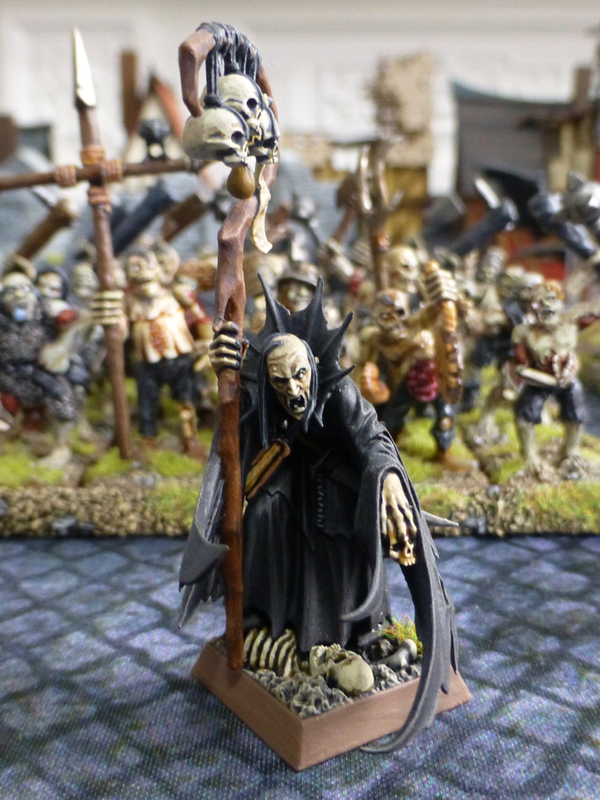 When the Winds of Hobby Motivation are waning, the Lore of Death can usually still squeeze the odd beat out of my shrivelled necromantic heart. 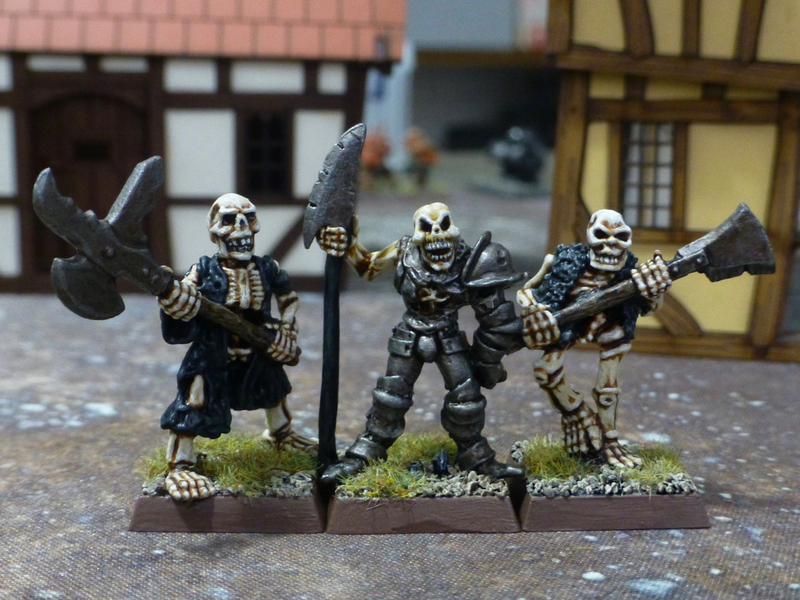 As one can never have enough skeletons, I painted up a couple of old metal Marauder and Citadel warriors of bone and two others which were part of a bundle purchase and possibly produced by Grenadier or another long defunct manufacturer. The Citadel figures are mostly slotta models with one that pre-dates this era. I went with my usual simple colour scheme of mostly black and iron while painting the more ornately armoured fighters with oxidised bronze plate. 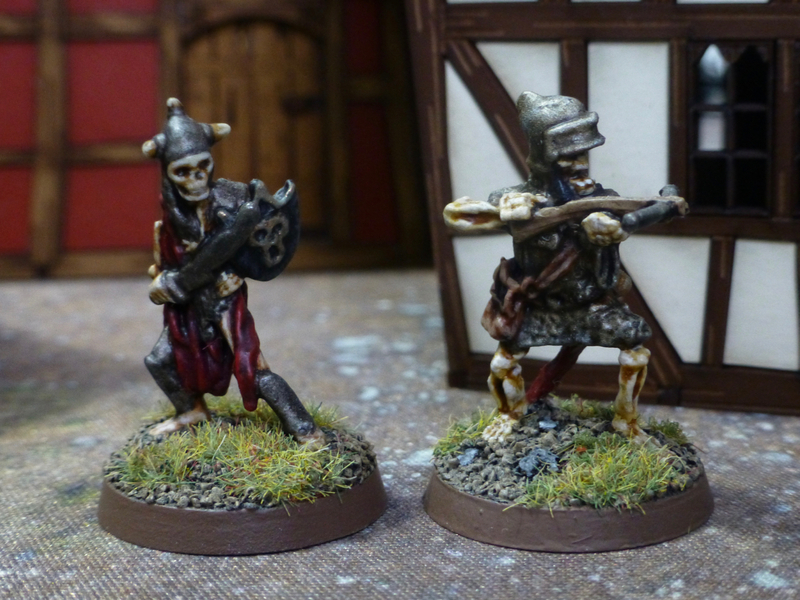 The non-Warhammer miniatures of a sword fighter and a crossbowman are based on round bases as I will use them in skirmish games like Frostgrave rather than my Oldhammer Undead army.